Hill Center is located in the heart of Washington DC, providing a unique venue for groups interested in green meetings, trainings and workshops. 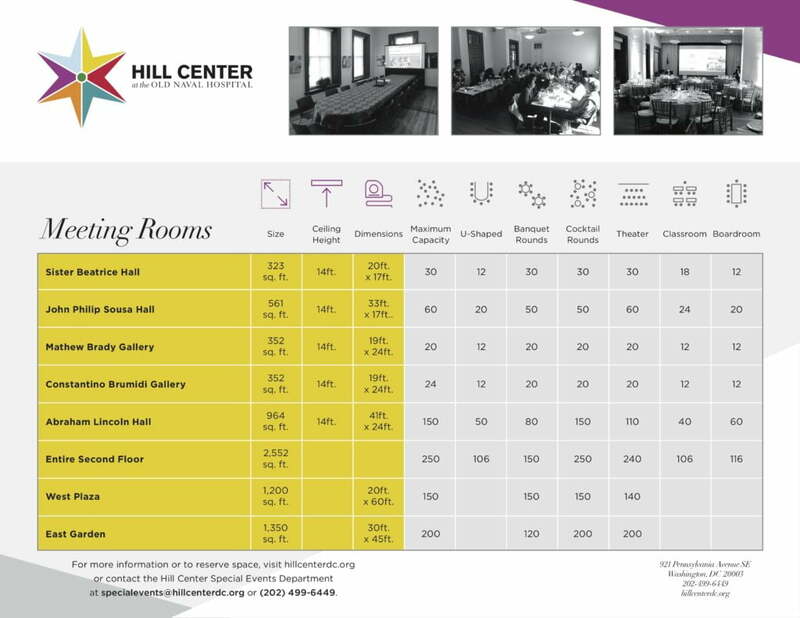 Hill Center offers all the perks of a historic venue, including light filled meeting rooms, with all the modern amenities you might like, including free WiFi. Ready to book space? Get Started. Use our flexible spaces as a boardroom for 10, theater style for 110, seated reception for up to 140 or cocktail reception for up to 250 on the entire second floor. Looking for something bigger? Use the entire campus, including our outdoor garden, for a gathering of up to 600 people. Take a virtual tour of Hill Center online! Use our flexible spaces as a boardroom for 10, theater style for 110, seated reception for up to 140 or cocktail reception for up to 250 on the entire second floor. Looking for something bigger? Use the entire campus, including our outdoor garden, for a gathering of up to 600 people. Interested? Check out our affordable rates for Conferences & Meetings. Prices range from $400-$3200, depending on meeting space and day of the week. Don’t miss our discounted meeting space for non-profit organizations! Emergency meeting supply kit, including pens, pencils, markers, scissors, stapler, paper clips, Post-It notes, tape, etc. This is an add-on service, in addition to your base rental fee. Save yourself time and money by letting us provide professional coffee and beverage service for an additional fee. Contact our Special Events team for pricing and more information. Book your non-profit organization’s event at Hill Center and receive a 15% discount on your rental. “Centered on you” isn’t a marketing pitch – it’s who we are. Hill Center’s dedicated team of special events professionals dedicate themselves to making a seamless and successful event for you and your guests. It’s always meaningful to hear from clients who are pleased with their DC meeting, training or celebration. This was a great event in no small part to your flexibility and responsiveness to all of our various questions beforehand as well as our onsite needs. The staff from the museum and our facilitators felt very taken care of…We received so many wonderful comments from our presenters and our participants on how much they loved the atmosphere of the building. One big attraction was the bright feeling in the Lincoln Hall that really added to everyone’s upbeat energy during a daylong workshop on an intense topic. The Hill Center is great! The building has lots of historic charm. The staff are so friendly and helpful. I host a student program there each year, and each of the second floor rooms are big enough to accommodate a class of students. I really enjoy hosting at the Hill Center! We know choice in vendors is important to you. Hill Center allows you to pick your own caters and vendors for your events, but here are a few who we think do a great job and know us very well!